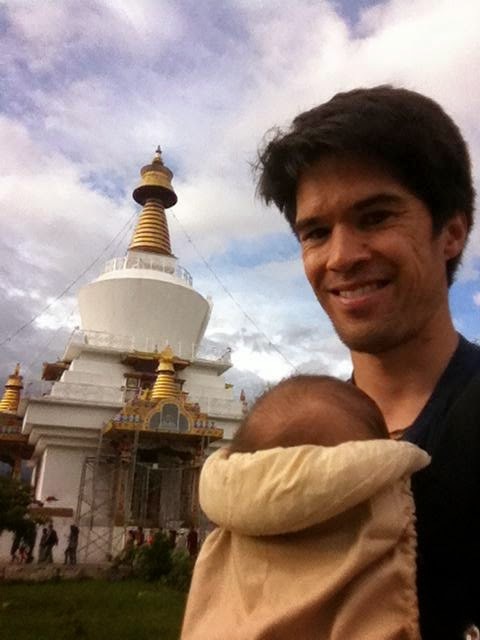 Blog of the Week – Baby in Bhutan! Sending out a warm Congratulations to BCF teacher’s Matt and Lucy as they welcome a baby girl and embark on yet another adventure to Teach in Bhutan! Matt and daughter Lily explore Thimphu! 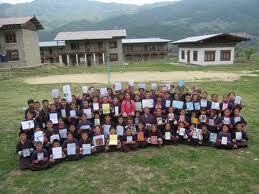 If you would like to learn more about BCF’s Teach in Bhutan Program, visit us at www.teachinbhutan.org. Deadline to Apply is July 31st, 2014! Our teachers are now settling into their unique placements across the country and making their apartments become their new homes. 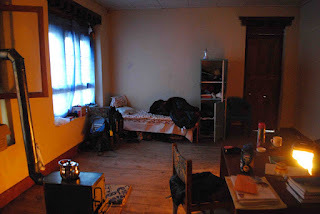 It takes quite a while to get everything ready (such as Internet, hot water, furnishings) but things are coming together for Kezia in Zhemgang! Kezia’s flat in Zhemgang. Lower half of the yellow building with blue door and window frames. Photo Credit: Kezia Zuber. Inside Kezia’s flat – her front sitting room. Photo Credit: Kezia Zuber. Kezia’s kitchen. Photo Credit: Kezia Zuber. To see some of our previous teachers’ accommodations, check out our post here! Reading Vicky and Ian’s last blog post as they headed on to a new adventure, after two passionate years living in Bhutan, made all of us sad but excited for all that has been accomplished and how strong we continue to grow together. As much as the scenery and the amazing students, one of the great privileges of working in Bhutan has been meeting so many likeminded people. They are a diverse group of individuals who share a passion for teaching and a commitment to life long learning. We spent a lot of the limited social time we had together discussing our students, our lessons, our methodologies and the Bhutanese system as well sharing our educational insights and our varied and wide ranging experiences in the classroom in an assortment of countries. We are all passionate about what we do and I would like to honour them in this final blog. It is our fervent hope that we remain in contact with such truly inspirational and dedicated people. Photo Credit: Vicky and Ian. To Vicky and Ian, and to every teacher that has given so much to Bhutan – we thank you and wish you the best in all your future endeavours! 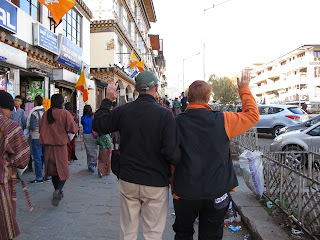 When BCF asked me to share an anecdote about my time in Bhutan I drew a blank. How could I sum up of an experience like this one? At first I wanted to share about my students but it was impossible to abstract one or two moments in the daily magic of teaching here. After a time my mind drifted back to a perfect spring day. My friend Becky and I had been on a tour of the east and decided to ride out to Khaling. I had it in my mind to visit the school for the blind there. I was born with a rare eye condition called Congenital Nastagmus which severely affects my vision. I yearned to meet with kids less fortunate then myself. We marveled at the undulating landscape and lush mountain passes on the way to our destination. Upon arrival I felt nervous ambushing these “disabled” children. But mostly I was excited to be fulfilling my ambition of visiting the school. I happened upon the students as they were eating lunch in the dining hall. At one table were students with low vision like me and at another table were kids who were completely blind. Some of the low vision kids were albino which is associated with Congenital Nastagmus and other chronic eye conditions. Immediately I struck up a conversation with Dorji a blind boy in a purple plaid gho who also happened to be a famous Bhutanese singer. Dorji adeptly led me around the nooks and crannies of campus swiftly using his cane for navigation. At one point he collided with another boy giving us all a good laugh. I spent several hours talking to the boys in their neatly arranged hostel. I also met the girls in the courtyard where one blind girl demonstrated Bhutanese brail by poking holes through carbon paper with an ear syringe device. I went on to visit the classrooms where I met a mentally challenged boy who had no eyes who groped my thumb with his little fingers. What struck me about these students was how they supported and assisted each other and enjoyed themselves like any kids would. Unfortunately we had to depart before the blind ball game scheduled for that afternoon. I left feeling inspired to be the best teacher I can be. Thanks Tim for the inspirational story! 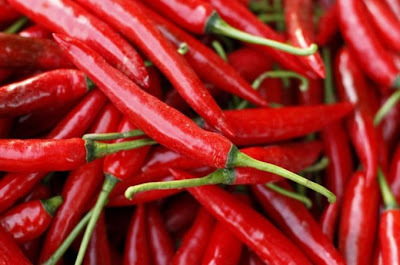 Chillies are a staple in the cuisine of Bhutan. It takes time for our BCF teachers to be able to adapt to the spiciness and the common practice of having chillies in nearly every meal – but once they get used to it, they tend to eat it up! Read the whole article from Al Jazeera English’s Gayatri Parameswaran at Bhutan’s tears of joy over chillies. 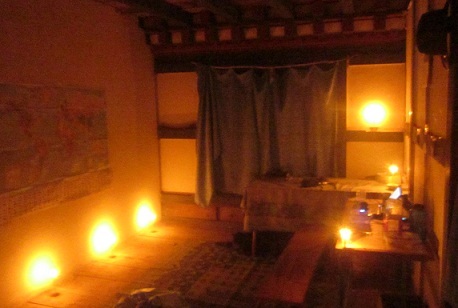 Accommodation varies widely in Bhutan and our teachers learn quite quickly that it is much different than what they might be used to back home. However, with the help of friends they meet, and the support of one another, they make their new homes warm, welcoming, and comfortable!